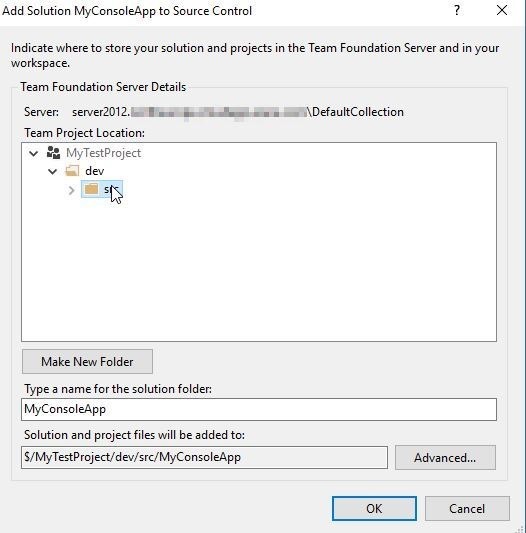 We are installing a Team Foundation Server on a Windows Server 2012 R2. You can choose many installation options. Single server, where you have a tfs database and the server itself on the same machine. Dual server, where tfs database is located on a different machine. Multiple servers where you can deploy your application tier across multiple machines. In this guide we will use a single server configuration. There are plenty of guides on installing the TFS server. The instructions on MSDN or Ban Day installation guide are sufficient to start in my opinion, so I will point you to these resources and skip the installation step in this post. We need to include - check the Public profile and save the rule. This will apply the rule to the public network as well so we will be able to connect over the insecure internet connection. Important note: For production environment use HTTPS protocol to access the web portal. 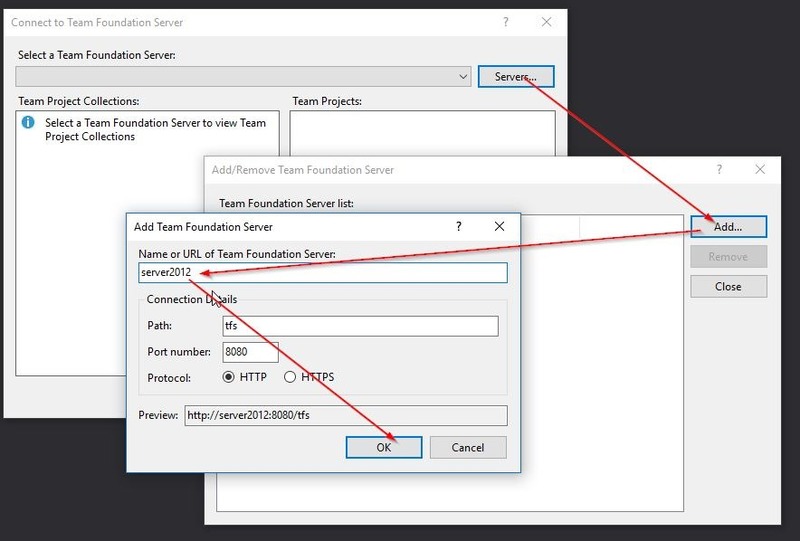 Once we are done with the installation and firewall configuration we should be able to access our Team Foundation Server via web browser on http://server2012:8080/tfs/. We will be asked for the credentials and we have to provide the user name and password for the account we created during the TFS setup. I didn’t do it, so will have to configure the agent manually. You can configure and register new agent by clicking on Download agent. You will get the zip file, which you have to copy and extract on the target machine where you want the agent to be running. Then you have to run the ConfigureAgent.cmd script and follow the prompts to setup the build agent. In this guide I will however show you how to use the default agent which is created during the TFS installation. Note that having the build agent running on the same machine as TFS server is efficient only for small production team or for evaluation purposes. The configuration process of the agent is the same for default agent as for non default agents so you will have to go through this step anyway. and run the ConfigureAgent.cmd script as a administrator. (You will not see the question for the replacing agent and server registration for the first time. I get it since I have been repeating the agent configuration more than once). Configure the agent against 'default' agent pool. Agent pools gives more granularity of permissions in large teams. Set work folder for the agent. This is the folder where recent sources will be downloaded and build output will be stored. Default is ok. Install agent as a windows service. The other option is to start agent in a console. Save the project and commit changes to the repository. 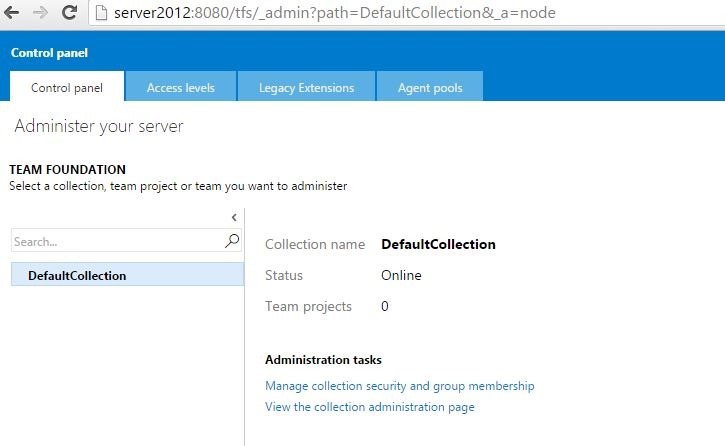 Now you should be able to navigate to the team project dashboard http://server2012:8080/tfs/DefaultCollection/MyTestProject/_dashboards. You can find the documentation about the TFS web portal on MSDN. In this post we only want to create and queue a simpe build definition, so click the Build section navigation link. On the next slide select the source project repository and check the Continuous integration (build whenever this repository is updated) so it will build the sources on every commit. More resources in this topic here. Click next and save the build definition with all its default. This is caused by lack of Visual Studio compiler on the agent machine. This is true since we didn’t install the Visual Studio there and we don’t want to install it on the build machine. So the only solution is to use the msbuild compiler instead. 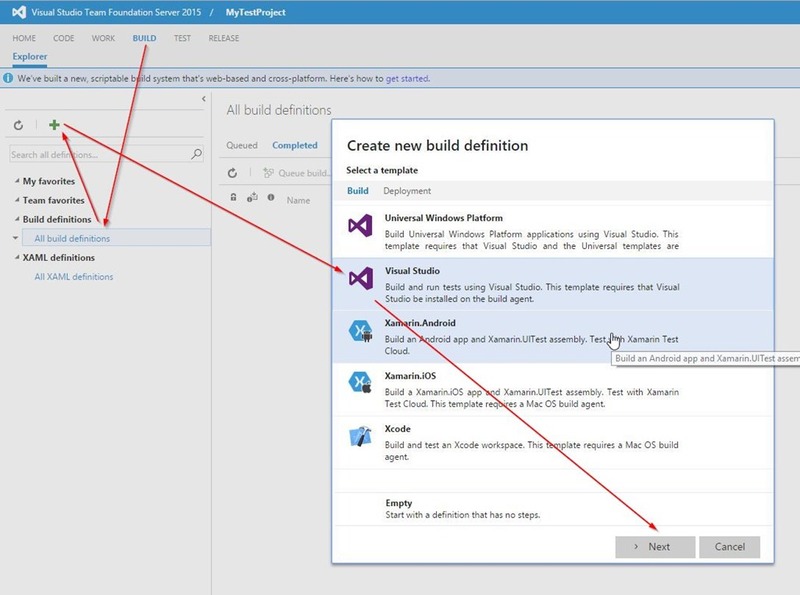 Create new build definition from empty template and add new build step to it (section build –> MSBuild). Queue the build and you will see that now it will succeed. 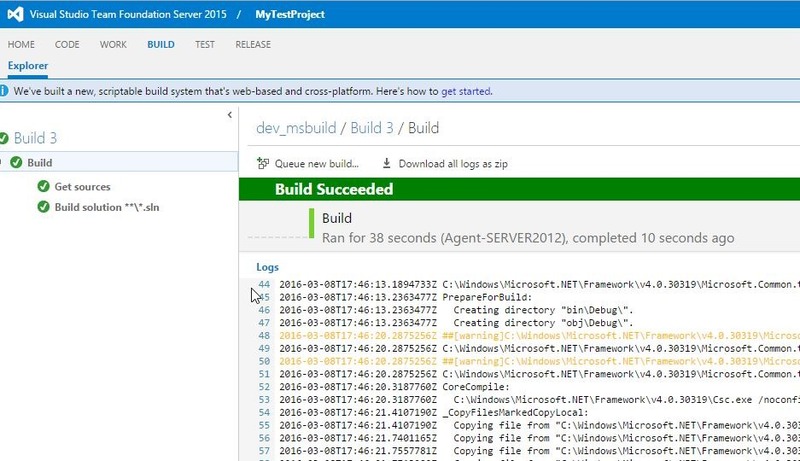 The build agent took the msbuild version installed with the .Net framework and used it to build the solution. 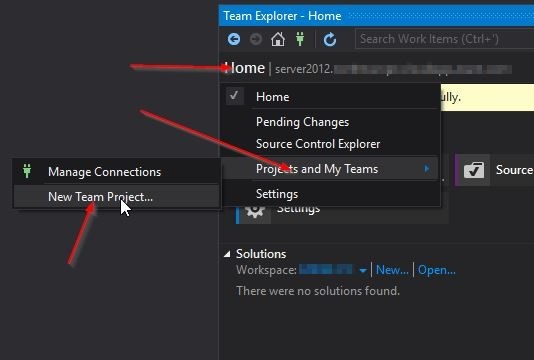 To fix that simply copy the missing folder from where you have the Visual Studio 2015 installed. That’s it for this time. 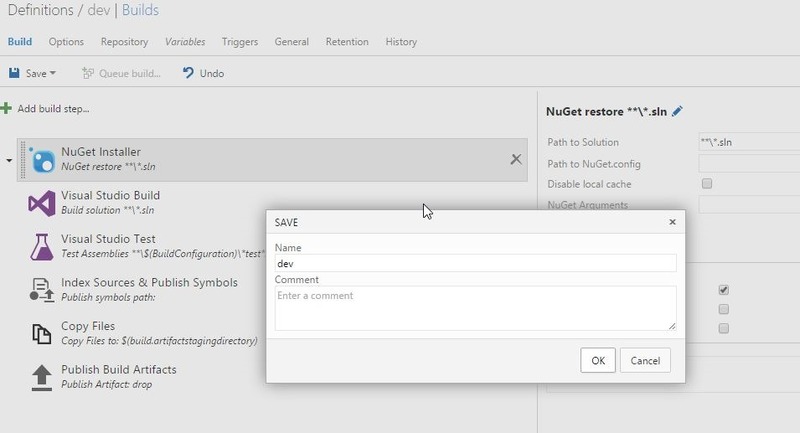 In next posts you will see how to configure the build definition template and how to create custom build steps.